At a time when so many books are heavily descriptive and overly-long, Frank Cottrell Boyce’s trust that readers can imagine a story and take the sense of it without him having to tell or even show them everything is delightfully refreshing. 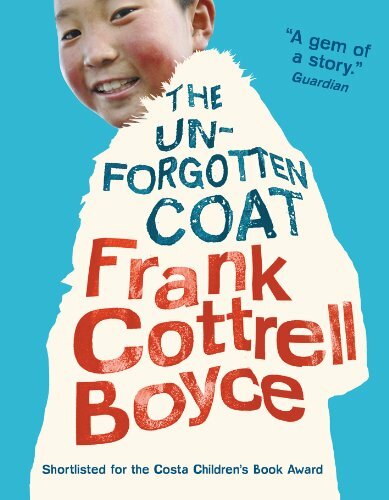 Apparently almost a fragment rather than a full blown novel, The Unforgotten Coat is nonetheless a gem of a story. And an important one, too. The superficially lightweight feel is accentuated by the physical appearance as it is written as if in an exercise book by Julie who looks back on an extraordinary incident that happened when she was in Year Six. In her account she describes the unexpected arrival at the school of Chingis and Nergui, two brothers from Mongolia. When they ask her to become their ‘Good Guide’ and show them what they need to know, Julie gets completely caught up in their stories and the imaginary and all too horribly real dangers they face. There is some fantasy to make it all palatable but no fake sentimentality or ducking of the harsh reality of the boys’ situation. Frank Cottrell Boyce’s familiar warmth and underlying compassion enable him to make moral points about society’s need to be tolerant and understanding without ever preaching.